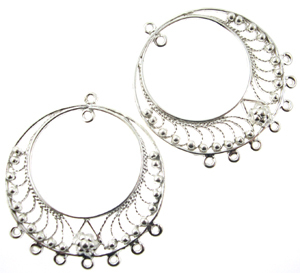 Sterling Silver Chandelier Earring - Large hoop with a lacy bright silver filigree pattern connecting the two hoops. Very pretty! With 7 attaching rings along the bottom, and one inside at the top of the lower hoop. Measures approximately 3.5cm (includes bottom rings, but not the top one) x 3.5cm. Price is for one pair (2 earrings).